Legacy of the Realms – February’s Campaign of the Month! Today we’re here with GM RRouillard talking to him about his awesome game Legacy of the Realms. There is a lot of gaming history here, and a really great wiki, be sure to read through the whole interview for some very juicy tidbits of gaming wisdom! First off, feel free to tell us about yourself if you want. Family, kids, pets, dayjob, alter ego, etc. I’m a young-at-heart 44-year old man who’s been a Middle School English teacher for eight years now. I’m currently a Ph.D. candidate (Education Technology) and will start my courses in March of 2012. I recently earned a Masters degree in Education, and despite the schoolwork, our weekly gaming sessions have helped provide a nice short break from reality—which all of us in the campaign appreciate. I’m a husband to a great wife who supports my D&D addiction, a father of two beautiful daughters (ages 14 and 11), and a son born in October of 2011. None of my children play D&D—although there’s hope for the newborn—but they’ve been very interested in our gaming sessions and have often watched us play. We also have two miniature dachshunds that have pretty much taken over the house. Besides playing D&D, which I’ve been playing since I was in 9th grade, I enjoy reading (fantasy and horror are may favorite genres). I also enjoy playing golf, playing the bass guitar and congas, playing video games and online games, and watching movies. Someday, I’d love to write a fantasy novel—nothing epic like Tolkien’s—but something that could at least be called a “page turner”. It’s definitely on my bucket list. So, Legacy of the Realms seems pretty expansive. I see a lot of FR material but I also see Sigil and some other stuff, tell us about it! In the early days of our campaign, I took my players all over the Forgotten Realms and beyond, like into Sigil and the rest of Planescape. We even did a bit of Spelljamming! We definitely took advantage of the wealth of published materials offered in 2nd edition and 3rd edition, but kept our roots grounded in the Forgotten Realms setting. Now with 4E, we’re starting to create arcs that are leading some of the characters into the Feywild and the Shadowfell. We recently had an arc that took us into the Nine Hells! But again, the Realms always seem to call the characters back home. It’s funny, but it didn’t even occur to me that Legacy of the Realms shares the same acronym as Lord of the Rings! Haha. Ed Greenwood, along with the other great writers who have shaped the Forgotten Realms, have often said that the Realms is a world players can transform and mold into their own. We’ve definitely ran away with that idea! I’ve certainly tried to keep the flavor of the Realms intact, but much to the players’ satisfaction, a lot of our arcs have deviated from Realmslore as well. For example, I’ve transformed the entire Sunset Vale into a region currently infested with undead, but because it’s the breadbasket of the Western Heartland, there’s a need for the players to free it from the undead scourge. This definitely veers off from Realmslore, but that’s what makes our campaign work. The players know it’s still the published campaign we know and love, but it’s also a world the players in Legacy of the Realms are now reshaping as heroes themselves. I’ve known Zack (Zaachaeus) the longest. I think we met back in the mid 90s. He’s been instrumental in re-launching the Forgotten Realms campaign I started before we met. Joe (Lo-kag and Ang) and Justin (Cain), along with their wives, joined us soon after. The other Richard (Caldreas), joined us when we were playing D&D 3rd Edition several years ago. The wives stopped playing, so it’s just the core five of us that have been playing in Legacy of the Realms for over a decade. Legacy of the Realms stemmed from a Forgotten Realms campaign I started back in the early 90s with a different group of friends. It lasted for a few years, but eventually ended. A few years later, a coworker named Zack and I started talking about D&D. He wanted to play, so I offered to restart my Forgotten Realms campaign. It was that earlier campaign that really got Legacy of the Realms going. We started with 2nd Edition and played through the 3rd Edition and have moved on with 4E. We’ve been running a Forgotten Realms campaign since it was first published. I see that your wiki has a pretty consistent syle, is that all you or do your players help? I’m the one that does all the upkeep with the wiki, but the players know they can add, subtract, or edit as needed. They have definitely done their part to help make the wiki a great place to record our gaming sessions. I couldn’t have done it without the players’ help and support. Do you get your players to participate on OP regularly? I ask the group to keep their character bios and information up-to-date. But a couple of the players are also DMs in their own right and have started OP wikis. We use the calendar and forum options, which have been great for our game. Speaking of your wiki, how much time would you estimate you’ve put into it? I remember once spending half of a Saturday writing up one adventure log because I wanted to record the details of the previous night’s awesome gaming session. I had a blast doing it too! I’ve spent countless hours on the wiki, but every second has been worth it considering how awesome it is to be able to go back and read what we’ve done as a group. With over 20 years gaming experience, the simplest advice I can give any GM is this: respect the players and allow them ownership of their own gaming experience. I don’t present myself as the ultimate ruler of our gaming sessions. The players respect me and allow me the role of DM, but they also know that they are stockholders in their own game. They roll their dice and determine the fate of their own characters. They oftentimes veer off from what I had planned, but I don’t force a story upon them. I’ve played in campaigns where GMs want to control everything, from rolling the dice for players, to forcing a storyline they want to happen. In the end, those campaigns fail. In Legacy of the Realms, it’s the players who create the overall campaign’s story. I simply come up with the basic plot, and the players fill in the details. As a DM, I never know what the players are going to do, but I always roll with it. It’s the I-never-know-what’s-going-to-happen factor that keeps us coming back for more and allows all of us to have fun on a weekly basis for almost 15 years now! Your 4e house rules are pretty neat if I do say so myself (4e is my game!). How and why did you come up with these? A few of our house rules have been ‘borrowed’ from online sources I’ve found, but most come from all of our years of gaming experiences. We’ve actually made up quite a bit of our house rules. We also added 3D models to make the game even more fun–again with house rules that enhances the use of the props. Overall, we want a game that challenges us as players, so we modify rules to make the game fun and as realistic as possible for us. Most are rules we’ve carried over from 3.0, but a lot have been modified from the existing 4E rules. We all agree that if an existing rule is “cheesy”, it needs to be modified. Speaking about 4e, with the announcement of an upcoming edition how has this affected your game? We’ve actually begun discussing this in our group. We decided that we should simply wait and see before we worry too much about it. Again, since we’re very familiar with all of D&D’s editions, we’re confident Legacy of the Realms will continue to grow—no matter what edition we decide to use. D&D has been the game for all of us, so it’s hard to imagine playing anything but Dungeons and Dragons. What would you say the biggest highlight from the game has been so far? Any particularly exciting battles or other scenes that have popped up? Honestly, every one of our gaming sessions has had its memorable moments. But I’d have to say that it’s the sessions when we’ve role-played the most and really got into our characters—whether it’s me with my NPCs or with the players and their characters—that have been what we call epic moments. We love a good battle with lots of dice rolling, so don’t get me wrong, but it’s those moments of character development that really makes our gaming sessions memorable for us all. In the end, it’s the role-playing that makes the game really fun for us. Be flexible and don’t let personal issues creep into the game. We play these games to have fun and momentarily escape reality, so why ruin it with outside factors that can be avoided? Also, let the rules be a guideline. Agree to change published rules if it’ll make the game smoother and more fun for all. In the end, it’s the story and character development that should matter and will make campaign last for years, if not decades. Thank you for considering us for COTM. Having seen the quality of other campaigns that have received this award, we are truly honored to receive this awesome recognition. 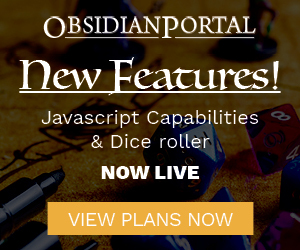 Thanks to everyone at Obsidian Portal for providing us with a place to share our gaming experience with everyone else. Well that’s it for February, I hope you all enjoyed it! Stay tuned next month for another stellar campaign and be sure to keep on nominating those you deem worthy for campaign of the month! Thanks RRouillard for your insights. Reading the interview with the creator of the current CoTM is my favourite thing on the OP Blog and yours is no exception. It’s always great to get an insight into how other players think and play. I don’t think I have seen your site before but will certainly look at it now.